The first week of the 2019 Winter Equestrian Festival (WEF) concluded competition on Sunday, January 13, with the $75,000 Rosenbaum PLLC Grand Prix at the Palm Beach International Equestrian Center. Beat Mändli (SUI) and Simba flew to the win of the first grand prix of the season. There were 37 entries in the Sunday afternoon grand prix, competing over a course set by Eric Hasbrouck of the United States. Only six found the key to a clear round and returned for a jump-off. First in was Mändli on Simba, owned by Grant Road Partners LLC. As one of three clear rounds, they set an unbeatable time of 37.539 seconds to secure victory. Daniel Coyle (IRL) and Ariel Grange’s Farrel were the only ones to come close to Mändli’s time, finishing clear in 37.769 seconds for second place. Coyle, who has been riding Farrel for three years, was pleased with the nine-year-old KWPN gelding’s move up to a higher level. “He’s really proven to me and everyone else that he deserves to be jumping this level because he can. I think after today there’s good things to come,” he said. Taking it slower and counting on a clear round were Tiffany Foster (CAN) on Donjo, another Ariel Grange-owned entry. They stopped the timers in 44.64 seconds for third place. “After I watched Beat’s round I knew I had no chance, so I decided at that point I knew there had been a few people with a pole down and I knew Daniel was coming behind me on a super-fast horse and is a super-fast rider, so I thought I would kind of hedge my bets and be double clear,” explained Foster. “My horse is very, very careful so it’s usually a pretty good gamble to try and go that way. Slotting into fourth place with four faults in a time of 39.122 seconds was Adrienne Sternlicht (USA) on Quidam MB, owned by Starlight Farms LLC. Kristen Vanderveen (USA) and Bull Run’s Faustino de Tili were fifth with 14 faults in 52.012 seconds, and Kevin Babington (IRL) placed sixth with 15 faults in 49.803 seconds. 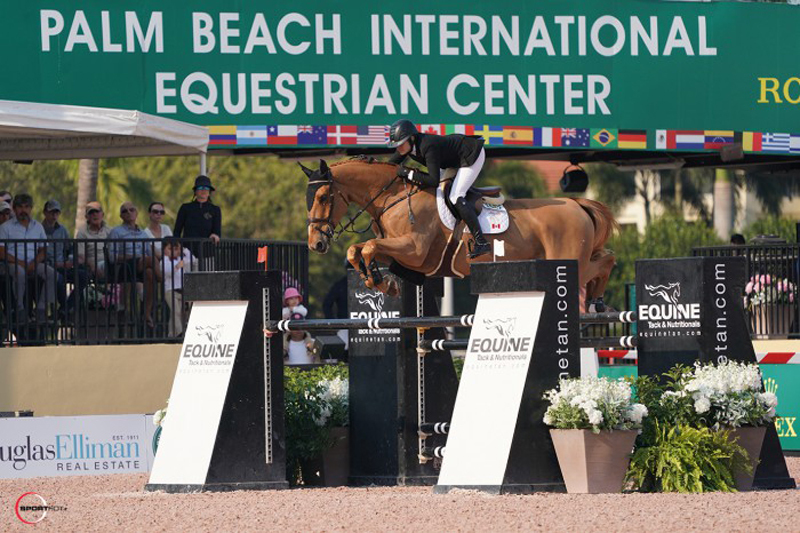 The second week of WEF will return to the Palm Beach International Equestrian Center Wednesday, January 16 with a full schedule of hunter and 2* jumper events including the $72,000 NetJets Grand Prix CSI2*. For a full list of results, please visit www.PBIEC.com.